(VOVWORLD) -Prime Minister Nguyen Xuan Phuc has called for the Vietnamese’s more determination to escape from the middle-income trap to live a prosperous and happy life. 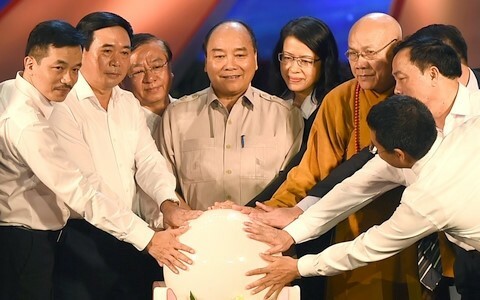 Mr. Phuc made the statement at the 17th national program on supporting the poor organized by the Vietnam Fatherland Front in Hanoi and Ho Chi Minh city on Sunday. He said that the Party and State have given top priority to hunger eradication and poverty reduction in its socio-economic policy over the past 72 years. Vietnam aims to reduce between 1% and 1.5% of poor households annually and soon achieve the UN 2030 Agenda on Sustainable Development Goals. At the ceremony, Prime Minister Phuc called on philanthropists to donate for the poor by texting VNN and send to 1408 with each SMS costing 20,000 VND.